Eskom implemented Stage 3 load shedding as from 8:00 am this morning. Enjoy the quiet, dark contemplation time and, when the power comes back on after Another Night of Candles, read this article and quietly weep into your cornflakes/breakfast/lunch/cold tea…. : How we as a Country CAN Avoid Stage 8 Loadshedding. Hit the dropdown and start typing in your suburb/district. 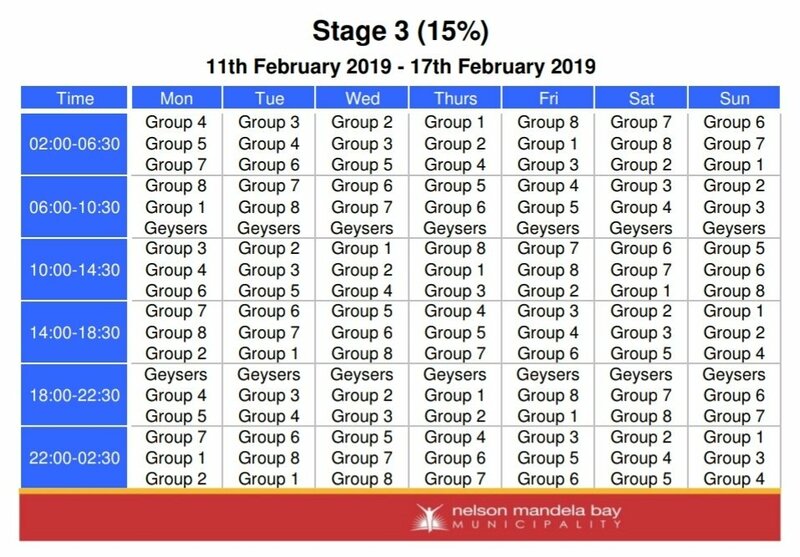 The Nelson Mandela Bay Municipality sets its own load shedding schedules and then activates those according to whichever stage Eskom declares for the day, week or month. Eskom implemented stage three rotational load shedding for a third consecutive day this morning. The power utility began load shedding at 8am, which is expected to carry on until 11pm tonight. Stage three calls for 3 000MW to be rotationally load shed nationally at a given period. “Despite the generating units returning to service as planned, the emergency reserves (diesel and water) are still very low,” said the power utility on Tuesday. The utility again reminded customers to treat all electrical points as live during load shedding. After terminating load shedding at 10:11pm on Monday, the utility warned that the probability of rotational load shedding remained high for Tuesday as a result of a shortage of capacity due to a number of generating units still being out of service due to breakdowns. However on Monday night, four of the utility’s units had returned to service, with the remaining three units expected to return to service today. Earlier on Monday, the power utility’s board held a meeting with management as well as Public Enterprises Minister Pravin Gordhan. The meeting — which was also held on the day the utility implemented Stage 4 load shedding — followed the unexpected return of load shedding on Sunday. “The escalation from stage 2 to stage 4 load shedding was caused by a further seven generating units that tripped within a period of five hours. This report on the causes, including all the challenges of the new and old power stations, was much of the deliberations between the board, management and the Department of Public Enterprises,” said Eskom. The marathon meeting, which lasted over six hours, saw the board provided with a detailed analysis about breakdowns in Eskom’s new build programme and at its fleet of older power stations. In addition, the Medupi and Kusile power stations located in Limpopo and Mpumalanga, respectively, continued to show a lack of reliability to contribute meaningfully to Eskom’s generating capacity, which the company flagged as a “a serious concern”. The two power stations are at the core of Eskom’s new build programme. At Monday’s meeting, the board, which was appointed in January 2018, resolved to institute an urgent review to establish when, realistically, these projects will be completed, the extent of design and other operational faults. “The board is also urgently embarking on an in-depth audit of the entire system to ensure that every technical problem is understood at a granular level and to avoid unexpected crises,” said Eskom. Meanwhile, board chair Jabu Mabuza said they remain uncomfortable about the stability of generating units. “We will keep the country informed of our progress over the next few days in providing better assurance about electricity supply,” said Mabuza. President Cyril Ramaphosa added his voice of concern at developments surrounding the power parastatal. In an interview with the SABC, President Ramaphosa said the implementation of Stage 4 load shedding came as a shock. “That is worrying and disturbing, and it has shocked me and made me quite angry that we have reached this stage of dysfunctionality,” he said in the interview conducted from Addis Ababa following the African Union (AU) Heads of State meeting. The President said he was expecting a report on the matter from Gordhan.